Google's just made it official. 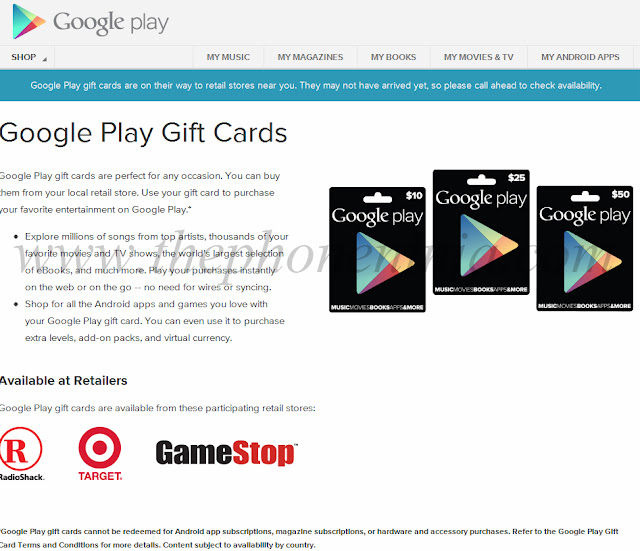 Google Play Gift Cards are rolling out in the next few weeks. We've known these were coming for about a week now, of course, first with some code in an update to the Google Play Store app, and a short while later when we were the first to get a peek at the official product. Now it looks like Google's really spinning things up. According to the Google Gift Card page, you'll be able to redeem codes for music, movies and TV shows, books and apps. However, app subscriptions (we're not 100 percent sure what that means), hardware and accessories are excluded. Cards will be available in denominations of $10, $15, $25 and $50. You'll scratch off a part of the card to reveal a code, which you'll then redeem at play.google.com/redeem. A Gift Card's balance will be visible in your Google Wallet account. Gift cards will be available at Radio Shack, Target and GameStop, according to the page.